Try turning off Frame pacing and see what you get. I betcha its a bit lower. He's not running crossfire so no need for frame pacing anyways. Excuse my lack of paint skills please! Tried to order blocks from EVGA Shop in the US and have them shipped to a friend in NH but EVGA don't accept international credit cards. You could use universal blocks, doesn't change much if you properly place heatsinks on your cards power circuitry. Could you do me a huge favour? 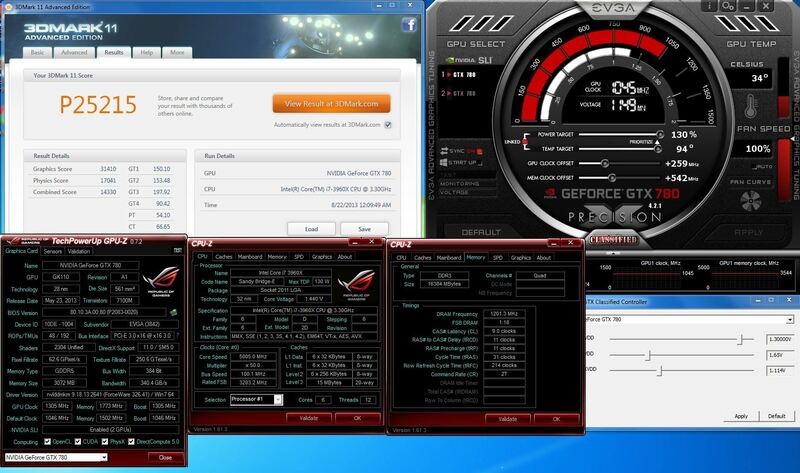 Could you run your cpu at 4.2GHz (I'm no a 3930k) and run just one of your Classy's. Give me a reference for my Titan at 1124Mhz. If not, no worries! Man that’s another good score! I’ve been watching the GTX780 scores at HWBOT and haven’t been that impressed when compared to the Titans but your cards look really good. Single GTX Titan 1400 MHz Core + 7 GHz mem. No optimizations, basically my gaming settings. I picked it up at ShopBLT. I guess that 5,3 GHz was on LN2? Can't be LN2, too low of a clock imo. My guess is Phase (still low for phase) or high end water cooling. I'm cooling it with an SS unit. Are you running yours on an R4E and if so which BIOS?